Essentia is the data management framework that aims to create a new fully owned data driven way to interact with technologies. And to bring our vision to the real world, when we see problems, we take the initiative to develop solutions. The Netherlands today is one of the most efficient and farsighted countries in the world. Having not only seen the potential in blockchain, they even created a dedicated program — Blockchain Pilots, to explore how the blockchain can be used in various spheres of today’s life. 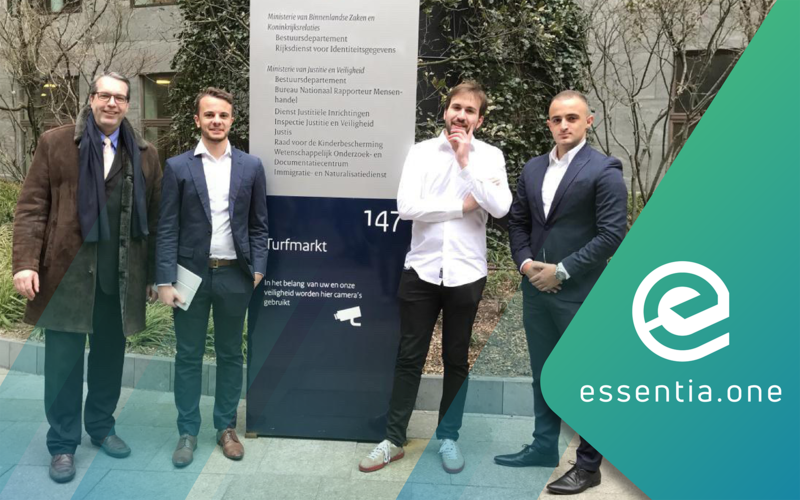 On Tuesday, the 20th of February, in The Hague, Matteo Gianpietro Zago (Founder), Mirco Mongiardino (Founder), Bedros Awanesian (Head of Business Development), and Erik van der Staak (Essentia Advisor) were invited to a joint meeting with them. During the session, the Essentia team shared their vision and thoughts on how the blockchain could be leveraged at border control points. Essentia performed a thorough analysis of the current border controls situation and proposed a practical interim solution to the Netherlands. Providing a detailed description of the Essentia framework and blockchain, as its underlying technology, Matteo and Mirco explained how the current issue process can be solved. The meeting between Essentia and the Netherlands went very smoothly, in an open atmosphere, where extensive, constructive discussions were made. They expressed great enthusiasm for the Essentia proposal and recognized the outstanding potential of our project. We would like to express our gratitude to the Netherlands for their kind invitation, genuine interest, and openness to the novel solutions we proposed. Essentia is optimistic that a working model can be implemented in the future, demonstrating another real world use case for blockchain.